So often during the night of the summer months in this beautiful part of Spain, the south east's night sky is so clear and awesome that when you arrive home in the dark, one feels the need or I do certainly, to observe the sky to try and understand the grandiose limitless wonder of the universe or simply to just enjoy the constellations and distant planets and stars. An app on my phone can tell me all sorts of great interesting information (not sure how the astronomers arrived at such detail of distances and composition) about the stars in the night sky. But I use it in those months when the temperatures at night, in our terraces, make it so comfortable to wonder in awe at the vastness of space. I need to invest in a powerful telescope to appreciate the night sky with more accuracy and clarity. 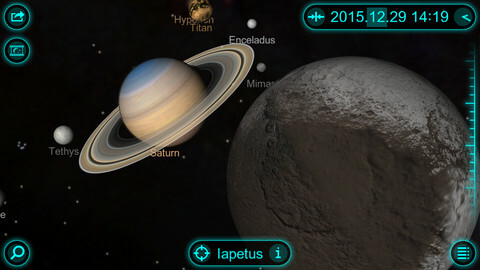 Solar Walk App - Saturn and its Moons. It is already 3 years since I had that kind of thought after arriving here to retire and I know that eventually, I will treat myself to such a device. But, so many people also share this kind of fascination for our night sky, especially scientists who are studying constantly the Universe, searching for new planets, galaxies or solar systems where there could be inhabited planets similar to our own. My phone app says there are many moons orbiting our solar system's nine planets. Their names? I don't know; there could be over 150 of them! Some astronomers speak of 170 or more, maybe too many names to learn... Now they also talk in terms of Pluto's downgrading as a planet. Is it not now out there? I believe it is but if it is no longer a planet, what has it become? Winter Constellations - Image by AstronomyTrek.com. So what do we have out there? 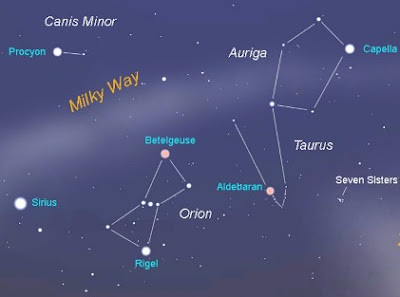 Constellations, solar systems, galaxies, planets, asteroids, stars of all sizes and distances from our planet, asteroids, dwarf planets and all kind of floating bodies in the sky: celestial bodies around our sun and many other stars. And astronomers say the Universe is growing constantly, towards where? How can there be so much space out there? They know there is, but how is it growing? They say they are discovering new solar systems all the time and in them more and more planets. Can we say it is unimaginable that we are alone in outer space? Clearly, they think otherwise or else they would not be searching all the time for other inhabited planets out there. As a matter of fact, only a few months ago NASA issued news of several planets that could possibly have a similar life as our own planet. In that vastness of space, one day a few planets will be discovered with a life of some sort or another and perhaps with beings possessing superior technology than our own. Maybe they are visiting us right now or have done so in the past and found us so primitive that they did not bother to say hello even and left us behind in our survival. But now we are traveling to other planets or will be soon, and already touched our moon so we are advancing all the time in our search for better space fuels to propel us through to other planets and eventually to other galaxies perhaps. Science fiction now has to look for much further horizons and I am sure it is all the time because so many of the so-called science fiction technology gadgets are already in our hands, in everyday use by almost everyone. If our planet was formed as a result of a giant explosion of gas and matter that made our star the sun and its other neighbor planets of ours around it, how many other planets can exist out there formed from the continuous explosions of gas and clouds of matter that perhaps one day will be called our space neighbors? Even if they happen to be hundreds of light years away from us? You pay a visit to your neighbors frequently or from time to time but how can we visit any of our neighbors in outer space? Well, the scientists and astronomers are busy on that front every day and they do not stop in amazing us with their findings and wisdom. These ideas and thoughts during the summer, are present quite often in my mind because of the sheer beauty of the sky at night in this part of the world. Writing this article to publish it also as a post on my site http://www.SweetHolidayHomes.com may give you a desire to visit this part of the world next time you feel you need a vacation to enjoy in this part of the world.